When thinking about the fiscal impact of immigrants — taxes they pay minus the costs they create for government — there is agreement that individuals (immigrant or native) with modest levels of education and resulting lower incomes are a net fiscal drain, paying less in taxes than they use in services. In contrast, more educated individuals (immigrant or native) earn higher incomes and are a net fiscal benefit. Prior research indicates that illegal immigrants have about a tenth-grade education on average. Given the education level of those likely to receive the Deferred Action for Parents of Americans (DAPA), it seems certain that allowing them to remain in the country will be costly to taxpayers. The DAPA amnesty will likely increase the cost to taxpayers as DAPA recipients will become eligible for more means-tested programs, such as the Earned Income Tax Credit and the Additional Child tax Credit. Any hoped-for increase in tax revenues from DAPA recipients would be offset by the added costs of such programs. It must be remembered that the costs stem not from the fact that illegal immigrants do not work, but rather their education levels, which result in low average incomes and low average tax payments. Their low incomes also mean that they or, more often, their U.S.-born children are eligible for means-tested programs. As for the impact on American workers, we can expect that, once given work authorization, illegal immigrants will become more likely to find relatively better-paying jobs that are currently off-limits to illegal immigrants because they require background checks and valid Social Security numbers. These include security guards, screeners, janitors, groundskeepers, and clerks employed in the public sector. This may benefit the illegal immigrants, but it also means native-born Americans and legal immigrants will face more job competition for the shrinking pool of better-paying jobs available to the less educated. Further, the Affordable Care Act (ACA) requires employers to pay a tax (penalty) if they do not provide health insurance. As amnesty beneficiaries are not covered by the ACA, this could create an incentive to hire illegal immigrants and avoid the penalty. In November 2014, the Obama administration announced its program to give legal status, including work authorization, identity documents, and other benefits to perhaps four million illegal immigrants.1 The Deferred Action for Parents of Americans (DAPA) program is for parents who have children who are legal immigrants or were born in the United States. This grant of administrative amnesty expands one the Administration granted to roughly two million other illegal immigrants in June 2012, referred to as Deferred Action for Childhood Arrivals (DACA). When considering the fiscal and economic considerations of DAPA, the most important fact to remember is that a very large share of illegal immigrants have modest levels of education. Prior research, as well as common sense, indicates that persons with this level of education (immigrant or native-born) create a large fiscal drain — using more in services than they pay in taxes. Their education level also means that they will generally compete with less-educated, poorer Americans for jobs. Understanding the Fiscal Impact of the Less Educated. In our own research, we estimated that 54 percent of adult illegal immigrants have not completed high school, 25 percent have only a high school degree, and 21 percent have education beyond high school.2 The Heritage Foundation in its 2013 study of illegal immigration estimated that, on average, illegal immigrants have a tenth-grade education.3 The Pew Hispanic Center has estimated that 47 percent of illegal immigrants have not completed high school and 27 percent have only a high school education.4 The education level of this population is key to understanding why illegal immigrants as a group do not pay enough in taxes to cover their consumption of public services. Table 1 reports important characteristics of adult immigrants and natives by education level based on Census Bureau Data from 2014. The table makes no assumptions about legal status and instead simply reports what the immigrants and natives told the Census Bureau about their income, welfare use, and other measures of socio-economic status. Focusing on those without a high school education or only a high school education in Table 1 shows that these less-educated immigrants and natives have low average incomes and often live in or near poverty and lack health insurance. Further, households headed by the less educated often access welfare and typically have do not have any federal income tax liability. There is nothing particularly surprising about the results in Table 1. Education has become the single best predictor of socio-economic status. It is worth noting that of households headed by an immigrant without a high-school degree, more than half are headed by an illegal immigrant. Yet the data in Table 1 still show that 61.3 percent of these households access one or more welfare programs. This is a strong indication by itself that illegal immigrant-headed households make significant use of welfare programs. Equally important, the table shows that while less-educated immigrants who have been in the country for 20 years are significantly better off than their newly arrived counterparts, they do not come close to closing the economic and social gap with natives. Since about half of illegal immigrants have less than a high school education, and about one quarter have only a high school education, allowing them to remain in the country unavoidability creates a significant fiscal drain on public coffers. It should be added that the overwhelming majority of working-age immigrants are in fact working, as are the overwhelming majority of natives.5 But workers with low levels of education, regardless of legal status, still often live in or near poverty, lack health insurance, and access the welfare system. The table also shows that the less educated often have no federal income tax liability. My own research and that of Heritage indicates that illegal immigrants with little education are a significant fiscal drain, but less-educated immigrants who are legal residents are a much larger fiscal problem because they are eligible for many more programs. For this reason, legalization will tend to increase net costs in the long run. But this fact should not be seen as some kind of moral failing on the part of the less-educated, immigrant or native. Rather it should be seen as reflecting the nature of the modern American economy that offers limited opportunities to the less educated and the existence of a well-developed welfare state, which provides assistance to low-income workers, particularly those with children. DAPA, the EITC, and the ACTC. There has been some interest in how DAPA might impact these two programs. Table 2 shows my estimates of the possible costs of DAPA recipients to these programs and their offsetting tax contributions. Based on Census Bureau data, I estimate that there are about 2.1 million illegal households with U.S.-born or legal immigrant children who have been here long enough to qualify for DAPA.10 In the discussion that follows, I report figures assuming that everyone eligible for DAPA comes forward and complies with the tax laws and receives the benefits for which they are entitled. We find that few illegal immigrants have federal income tax liability. Our analysis of the Census Bureau data indicates that only 24 percent of illegal immigrants have any federal income tax liability at all. That is, one in four illegal immigrant households would pay federal income tax if they were paid on the books given their income and other characteristics. Of those who do have tax liability, it averages only $1,233 annually. Nonetheless, compliance with income tax law should increase with legalization and we estimate that income tax receipts would increase by $1.3 billion as a result of DAPA. To be clear, this estimate, like the one for the EITC and ACTC, assumes all those eligible for legalization come forward and receive it and that the immediate rise in earnings for amnesty beneficiaries is 5 percent. While illegal immigrants make relatively modest federal income tax payments and that is not likely to change with legalization, they do pay a good deal in Social Security and Medicaid taxes. FICA taxes, as they are known collectively, are not based on income, number of dependents, or other factors like the income tax; instead it is a flat tax. Including the contribution employers make on the behalf of their workers, Medicare and Social Security come to 15.3 percent of earnings. I estimate that, given their earnings, illegal immigrant households would pay $6.84 billion in additional FICA taxes if legalized.12 If we combine the total increase in income and FICA taxes, then the total increase would be $8.14 billion annually as a result of DAPA. This would be offset by costs of $9.24 billion for the EITC and ACTC for a net drain of slightly roughly one $1 billion annually. These estimates indicate how legalization can both increase tax revenue and costs to taxpayers at the same time. We also cannot say how much illegal immigrant incomes will rise with legalization. I have assumed a 5 percent immediate increase in my analysis. However an increase of, say, 10 percent would make little difference in the above estimates. The hope is that the income of illegal immigrants would rise, but it must be remembered that their education levels would remain much lower than the rest of the U.S. population so their income will continue to be low relative to natives. Finally, we do not know how many fraudulent applicants there will be for DAPA nor do we know how many DAPA recipients will use fraud to receive EITC or ACTC programs. Prior amnesties as well as the EITC have been plagued by fraud.14 Thus there is uncertainty for some of the elements used to generate the above estimates. It seems very likely that DAPA would benefit illegal immigrants by allowing them to move into higher-paying jobs. The hope would be that they would be less exploitable and therefore would not under-cut the wages of natives. Whether this turn out to be true is another question. However, there are other issues to consider that may work against the interests of native-born workers. These issues should at least be considered. A Bleak Labor Market for the Non-College Educated. In any discussion of giving work authorization to illegal immigrants, it must be remembered that the labor market situation for native-born workers has not come close to returning to 2007 levels even with the recent improvement in the job market overall. Figure 1 reports employment rates (share working) for working-age natives (18 to 65) using data from January 2015, 2007, and 2000. As the figure shows, the employment situation looks dramatically worse for less-educated natives in 2015 than in 2007 or 2000. Thus, despite recent job growth, the share of natives holding jobs remains well below the level in 2007. In fact, the share of natives holding a job in 2007 was actually well below the levels in 2000, as natives never fully recovered from the 2001 recession. In January of this year, there were still 49.9 million adult natives (ages 18 to 65) not working, almost 41 million of whom do not have a bachelor's degree. In January 2000, there were 31 million natives (18 to 65) without a college degree not working.15 It should also be added that wages for workers with less than a college education show no long-term growth.16 Giving immigrants work authorization may well benefit illegal immigrants, but it will also add millions of individuals with work authorization to the labor force at a time when less-educated natives continue to struggle. Increasing Job Competition. Once given work authorization, illegal immigrants are more likely to compete with Americans for better-paying jobs that are now generally off-limits to them because they require background checks and valid Social Security numbers. Such jobs include security guards, screeners, janitors, groundskeepers, and clerks employed in the public sector. In addition, illegal immigrants often cannot work at jobs associated with interstate transport and delivery, as background checks are common for such jobs. Considering security guards, my colleague Karen Zeigler and I have estimated that less than 3 percent of this occupation is comprised of illegal immigrants. But that will almost certainly change if DAPA moves forward and illegal immigrants gain Social Security numbers and government-issued identification. There are over one million security guards in the United States and, in general, it is a job for people who do not have a college education that pays relatively well and typically provides benefits. We have also estimated less than 1 percent of airport and other transportation screeners are illegally in the country and less than 10 percent of truck drivers are illegal immigrants. 17 Again, these relatively well-paying jobs for the non-college educated will now open up to illegal immigrants. That may well benefit illegal immigrants, but may also reduce the job prospects of natives. The ACA's Incentives. In addition to placing more of America's workforce into competition with illegal immigrants, DAPA may also adversely impact natives because of an odd provision of the Affordable Care Act (ACA). The ACA penalizes employers with more than 50 employees (up to $3,000 per employee) who do not provide health insurance if even just one of their workers goes to the insurance exchange and receives a subsidy. The idea behind this provision is to incentivize employers to offer health insurance. If only one employee gets a subsidy from the exchange, the employer is penalized up to $3,000 for all of its full-time employees. However, unlike other workers DAPA recipients are not subject to the ACA and cannot get subsidies, therefore employers will not have to pay any penalty for their lack of insurance. This could create a strong incentive to hire amnesty beneficiaries over natives and legal immigrants. Because employers are penalized if only one worker does not have insurance and gets a subsidy from the exchange, companies will still have to provide insurance to natives and legal immigrants, but not DAPA recipients. They could do this by putting only DAPA workers into jobs that do not provide insurance. For example, a company could provide health insurance to management, but not support staff and then hire DAPA recipients for support staff positions. It might also be possible for a company to provide insurance to only existing workers, but not new workers, at least for a time. Employers could then hire amnesty recipients when positions become vacant. While it is not clear how much the ACA might lead to amnesty recipients getting jobs over natives and legal immigrants, the possibility certainly exists as the incentive to do so is significant at $3,000 a year for each employee. When it comes to thinking about the fiscal impact of immigrants, the most important point to consider is the education levels of the immigrants in question. The overwhelming majority of illegal immigrants have modest levels of education, with three-fourths having no education beyond high school. The fiscal problem created by less-educated immigrants exists even though the vast majority of immigrants, including illegal immigrants, work and did not come to America to get welfare. The realities of the modern American economy, coupled with the modern American administrative state make large fiscal costs an unavoidable problem of less-educated immigration. This conclusion is not controversial as it reflects common sense and prior research. Of course, the fiscal costs are only one consideration. There may well be other compelling reasons for allowing illegal immigrants to remain or even granting them amnesty. But if we do so, we should at least be honest with the American people and acknowledge the very real fiscal costs of allowing illegal immigrants to remain in the country. 2 "A Guide to the Immigration Accountability Executive Action", Migration Policy Institute, November 2014. 2 Steven A. Camarota, "Immigrants in the United States: A Profile of America's Foreign-Born Population", Center for Immigration Studies, 2012, p. 69. 3Robert Rector and Jason Richwine, "The Fiscal Cost of Unlawful Immigrants and Amnesty to the U.S. Taxpayer", Heritage Foundation, 2013. 4Jeffrey S. Passel and D'Vera Cohn, "A Portrait of Unauthorized Immigrants in the United States", Pew Hispanic Center, 2009. 5The public-use file of the January 2015 Current Population Survey collected by the Census Bureau shows that 69.4 percent of immigrants ages 18 to 65 were working, as were 69.7 percent of natives in the same age group. 6The New Americans: Economic, Demographic, and Fiscal Effects of Immigration, Washington, DC: National Academies Press, 1997. 9Steven Camarota, "The High Cost of Cheap Labor Illegal Immigration and the Federal Budget", Center for Immigration Studies, 2004. 10For a discussion of how we estimate illegal immigrants using Census Bureau data, see "Immigrants in the United States: A Profile of America's Foreign-Born Population", Center for Immigration Studies, August 2012. 11Steven A. Camarota, "The High Cost of Cheap Labor Illegal Immigration and the Federal Budget", Center for Immigration Studies, 2004. 12I estimate that households that are headed by illegal immigrants who would qualify for DAPA have average earnings of $42,600 a year. This may seem high, but it must be remembered that this is an average, not a median figure. Second, these households are almost twice the size of the average native household, 4.7 members vs. 2.4 members for natives. Also, native households have 27 percent higher earnings even though they are half the size. This means that the per-capita household earnings of native households is roughly $22,500 and only about $9,000 for illegal immigrant households. Further, natives have much more unearned income than illegal immigrants, making the income disparity between the households even larger. 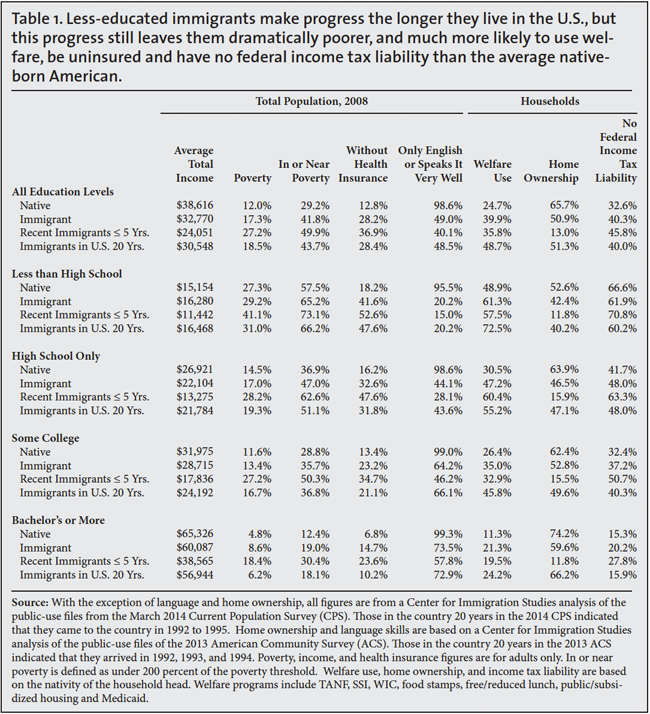 For these reasons, native households have much higher federal income tax liability than immigrant households. However, illegal immigrant FICA tax liability, while good deal less than for natives, is still substantial as FICA is a flat tax. 13Treasury Inspector General for Tax Administration Report, Reference Number 2011-41-061, July 7, 2011. 14Fraud has been a serious problem with the EITC; see Treasury Inspector General for Tax Administration Report, Reference Number 2013-40-084, August 2013. It is also generally acknowledged that roughly one-third to one-fourth of those legalized under the 1986 IRCA amnesty did so fraudulently. See p. 2 in Steven A. Camarota, "Amnesty Under Hagel-Martinez: An Estimate of How Many Will Legalize If S. 2611 Becomes Law", Center for Immigration Studies, June 2006. 15Figure based on an analysis of public-use monthly files of the January 2000, 2007, and 2015 Current Population Survey (CPS). The CPS is collected by the Census Bureau for the Bureau of Labor Statistics and is the nation's primary source of information the labor force. 16The Economic Policy Institute has tracked the lack of wage growth. Their most recent findings can be found here. This report provides a detailed breakdown by educational attainment. 17 Steven A. Camarota and Karen Zeigler, "Are There Really Jobs Americans Won't Do? A detailed look at immigrant and native employment across occupations", Center for Immigration Studies, 2013. Steven A. Camarota is Director of Research at the Center for Immigration Studies in Washington, D.C. He holds a Ph.D. from the University of Virginia in public policy analysis, and a Masters degree in political science from the University of Pennsylvania. In recent years he has testified before Congress more than any other non-government expert on the economic and fiscal impact of immigration. For a number of years he was lead researcher on a contract with the Census Bureau examining the quality of immigrant data in the American Community Survey. His research has been featured on the front pages of the New York Times, Washington Post and USAToday as well as many other media out lets. He has written academic articles for such journals as the Public Interest and Social Science Quarterly. He has also written general interest pieces for such publications as the Chicago Tribune and National Review. He appears frequently on radio and television news programs including CNN, MSNBC, Fox News Channel, "NBC Nightly News", "ABC World News Tonight", "CBS Evening News", National Public Radio, and the "Newshour" on PBS.